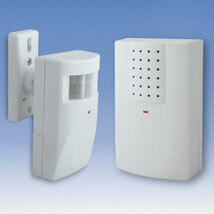 Motion activated sensor detects movement and sends a wireless signal to the door chime. This commercial quality Motion Activated Door Alert is great for any entrance that doesn`t have a door that opens or closes. 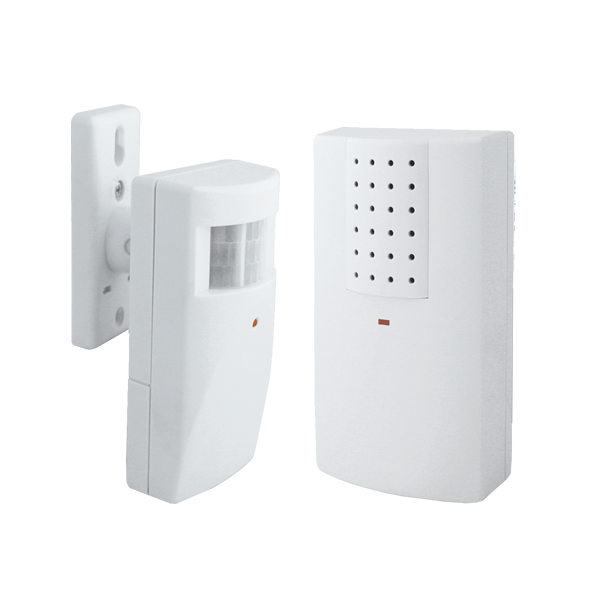 The sensor detects movement and the green LED on the detector unit will light up and send a wireless signal to the door chime and the chime will sound. A choice of 8 selectable melodies: Westminster, Ding-dong, Telephone Ring, Circus Theme, Banjo On My Knee, Twinkle Twinkle Little Star, It`s A Small World, or Dog Barking. Operates 1- 9 volt and 2 - C batteries (not included) and requires no wiring. Features wireless transmitter so you can take it with you up to 100 feet (range will be reduced through walls or ceilings). Will not work on metal door frames.